What are Hemp Extract (CBD) Gummies? Hemp Extract is a natural supplement derived from the Industrial Hemp plant. Known for its wide-ranging therapeutic benefits, Hemp Extract has a growing reputation for its potential to help relieve symptoms of many mental and physical health conditions. Hemp Extract can be taken like a daily vitamin, and it can also be used to target specific problems in the body. Our Hemp Extract contains a pure compound called “CBD” with no traces of THC, making it non-psychoactive and federally legal. To make our signature gummies, we infuse fun, chewy gummy bears with a potent dose of our premium Hemp Extract. These High Potency CBD Gummies are the perfect option for daily use and on-the-go individuals, as they contain a pre-measured dose in an easy-to-take form. Our High Potency CBD Gummies offer all the wellness benefits of the CBD compound in a tasty little snack. 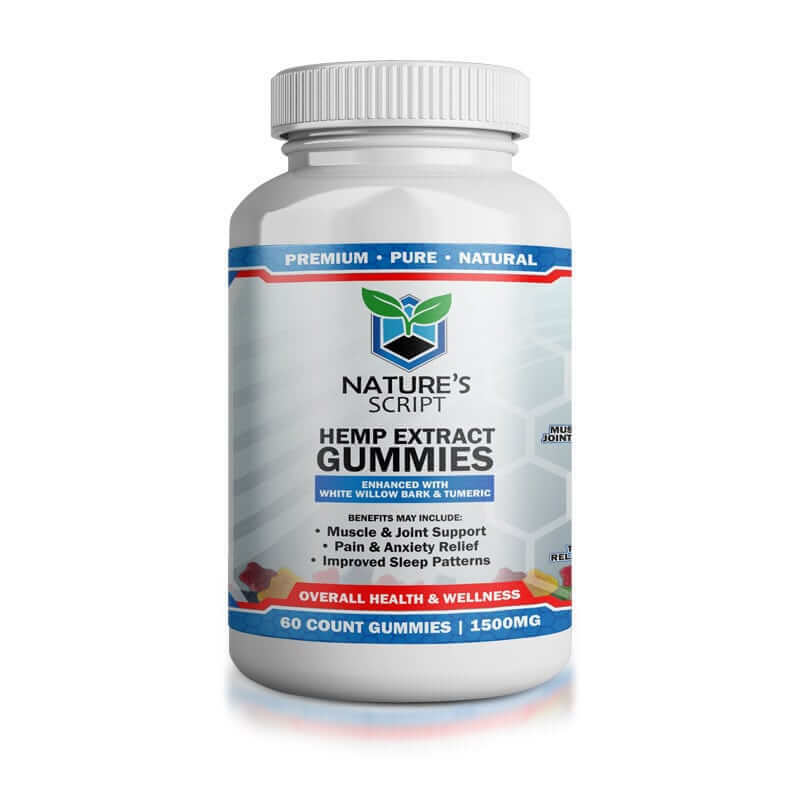 It’s no surprise Hemp Extract Gummies are a Nature’s Script best seller. It’s important to keep in mind that CBD affects everyone differently, depending on age, weight, gender and a variety of other factors. We recommend starting with one gummy per day to see how they help you. 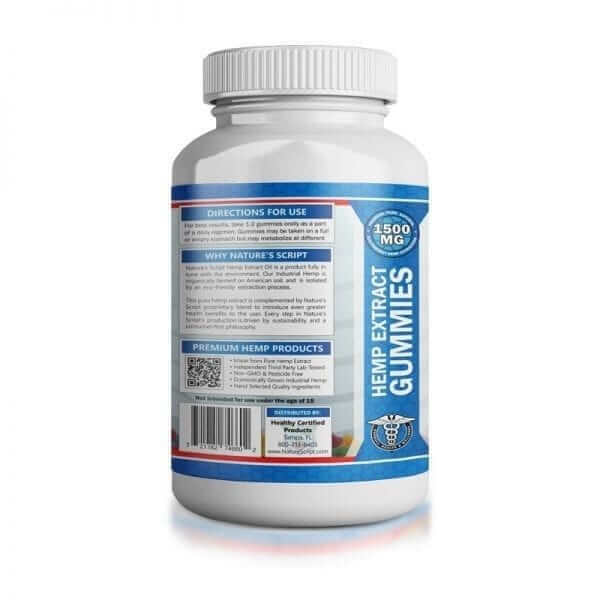 If you feel you need an additional boost, increase your daily dose to two gummies per day. You can take one in the morning and one at night or take the two gummies together. For best results, take gummies consistently every day. What are the potential benefits of CBD Gummies? Our High Potency CBD Gummies can benefit many people, as it offers a multitude of potential health benefits in the body and mind. 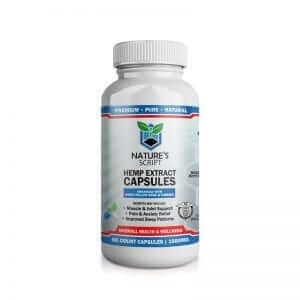 Hemp Extract works in harmony with the system in your body responsible for regulating important functions like sleep, mood, pain sensation, immune responses and more. Our customers commonly use Hemp Extract to potentially help treat anxiety, insomnia, depression, pain, inflammation and more. CBD can also be taken daily for a boost of wellness benefits. 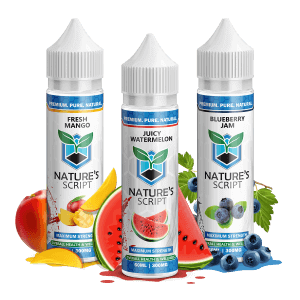 At Nature’s Script, we believe in the highest quality standards from plant to production. Our premium Hemp Extract is derived from organic, high-quality Industrial Hemp that is grown with sustainable methods. From there, we control every aspect of the manufacturing process in-house. This allows us to monitor quality and maintain attention-to-detail through every step until the product is ready to ship to you. We also work with a third-party lab to confirm the potency of our CBD. By focusing on quality, we can feel confident in giving you a pure, effective product that can help you achieve your wellness goals. Excellent customer service! They helped me switch my order to the high potency before my order shipped out, Cannot wait for them to get here. Amazing results! I was skeptical and now I’m sold on these high potency gummies. Just bought another bottle. My mom takes these for her back pain and she says she loves them. I came over and she was walking around cooking, playing with her dog, cleaning her house, etc. I haven’t seen her so mobile in years. I will definitely reorder for her soon. Since taking the HP Gummies I no longer have the anxiety I used to have every day. I can’t say enough about them. Just don’t stop ever making them. My boyfriend takes these because he suffers from severe lower back pain due to being in a car accident a few years back, anyways these have calmed down the chronic pain he experiences. Thank you so much Nature’s Script!! Great product that really works as described. When I take medication, I have to take the strongest around. I dont know why. But when my doctor recommended that I take these gummies, I thought, theyre gummies, how good can they be? Imagine my great surprise when I actually was able to sleep through the night without my arthritis waking me up! Thank you so much! I will be a repeat customer for life. You have a beautiful website. And the ordering process was simple. Good work. Two of these little buddies before bed and I can sleep through the night. WooHoo! Very relaxing. I can recommend them. these gummies are like my little angels, me and my husband sleep so good after taking these. Extremely happy with these hemp gummies. I’ve been eating 2-3 at a time and it is amazing how it relaxes me. That’s some high quality hemp in there. So in love with the high potency version of the hemp gummies. I made another order and it will be my second bottle and I would be lost without them! It has changed my life for the better! I sleep through out the night now and my inflammation doesn’t even bother me any more. Ordering was easy and I’m looking forward to testing them out. I really enjoyed the gummies. Trying the oil next. I spoke with the very able folks in customer service and they steered me towards the high potency gummies based on my symptoms. It’s nice to talk to those in the know on the subject of hemp, since I know very little. Nobody has the level of customer service as you do. Cathy in cust. service went above and beyond schooling me on your products and how they work. Then gave me some choices of products she thought might help. I started on the high potency gummies and my experience has been very good. It has allowed me to relax, take the edge off and even sleep better. I am sold. Improvement over your regular gummies. I like these a lot. I feel I paid too much for these but I have to say they do work well. And they are still cheaper than my prescribed pain pills. I took 2 of these thinking they would help me sleep. They didn’t do anything for me, I still stayed awake most of the night. My pain is much much better. I was in a bad car accident 2 years ago with several neck and back problems. And lots of pain. The gummies helped reduce the pain, believe it or not. This is a welcomed product. I am a sufferer of constant anxiety and stress. I work in the insurance industry and it’s a high stress environment. The hemp gummies calm me down and allow me to focus better. Even my husband can see the difference in me. I come home more relaxed and happier. Even helps with my drive home. I thought I’d try the highest potency gummies you have to offer. And yes, they are stronger than your others. I only need to take one before bed and it’s good night. Great. Surprised how well these work. They are a great way to “purge” the stress and troubles from a hard day. I actually look forward to them after work. I have noticed my mood is so much better on these gummies. I started with the regular strength but I can tell a difference in these high potency gummies. Thank you. I really like this company! The products are very high quality and the ordering was very easy. Excellent product and excellent service. 5 stars. This is simply a great product! I’m a high strung person at work because of my job and have noticed my level of anxiety and stress is MUCH less. Even my co-workers noticed and remarked. I tell everyone about them. Great customer service. I just started using these last night. Slept like a newborn. I will update again in a couple of weeks with latest results. These are the best! Handles my stress and anxiety like nothing else. Highly recommend. This is powerful stuff. Best I have found. They help me relax and fall asleep. I give them 5 out of 5 stars.